View "Full Pricing Table" below for detailed pricing and additional sizes! Click to learn how to build a case with multiple colors/patterns. Now you can BUILD YOUR OWN CASE with a mix of colors and still get full case pricing (however a handling charge of $2 is applied for the first 2 colors in the case and then 50 cents for each additional color over 2). If you want to mix and match colors within a case, please fill in your roll or case 'Quantity' and then select 'Mixed Colors in a Case' for your 'Color' choice. You will specify the colors breakdown after you click 'Add to Cart'. - Choose Size - 1/2 in. x 10 yds. *10 yd.length rolls 1/2 in. x 60 yds. 1 in. x 60 yds. 2 in. x 10 yds. *10 yd. length rolls 2 in. x 30 yds. *30 yd. length rolls 2 in. x 60 yds. 3 in. x 60 yds. 4 in. x 60 yds. 6 in. x 60 yds. 8 in. x 60 yds. Purchased Most Frequently: 2 in. x 60 yds. (Black) | See Pricing Table below for additional options. $ Price/photo will update once color & size have been chosen. Before ordering, please read the "Product Description & Specs" tab content for more information about this item. Scapa discontinued 125 in blue, red and yellow. 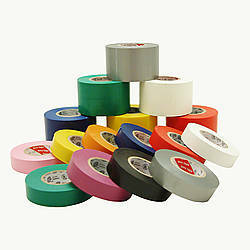 Please see Polyken 510 or Pro Tapes Pro-Gaff as an alternative. 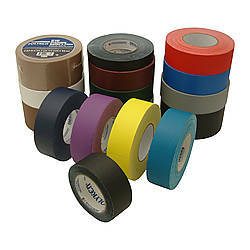 High-quality, vinyl-coated cloth construction, and economically priced Scapa 125 Economy-Grade Gaffers Tape is ideal for large jobs and budget-minded operations. It features a single coating of a natural rubber-based adhesive with a low-gloss finish. Scapa 125 has a relatively low to moderate adhesion level (only 28 ounces per inch), so it's a great choice for anyone not requiring aggressive adhesion. 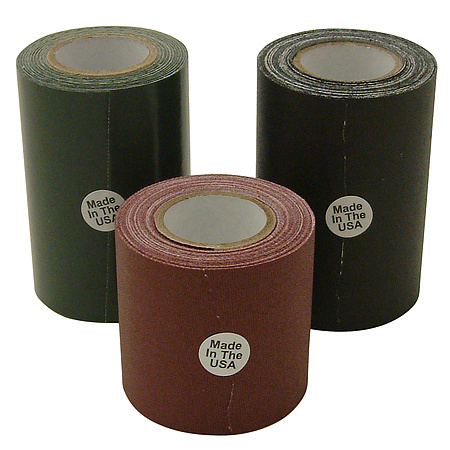 This tape will perform well in floor and stage marking and other applications where you need adhesion on hard, non-carpeted surfaces. 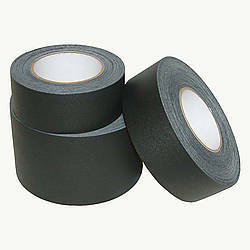 The lower adhesion means the gaffer tape is unlikely to leave any adhesive residue behind. 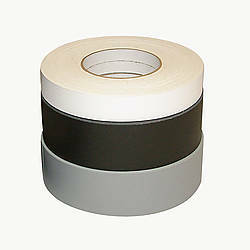 This tape features Scapa's extremely low-gloss backing and reflects the least amount of light of all the gaffer tapes we sell. Scapa 125 is not recommended for applications such as wire securing or cable hold-down. 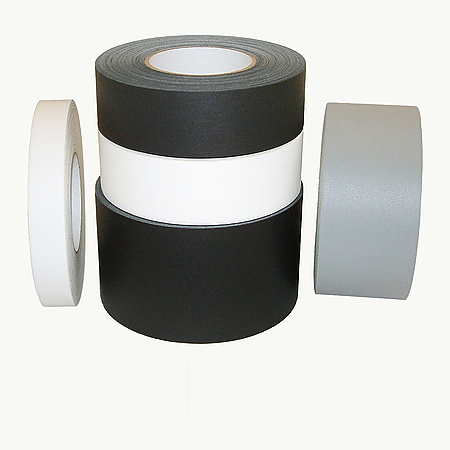 Note: FindTape can offer Scapa 125 gaffers tape in non-standard sizes due to our converter receiving the tape in wide width log rolls. These cut rolls will be shipped on non-branded, plain white cores. Adhesive: natural rubber How are adhesives different? Thickness: 11 mils (carrier, adhesive) 3.75 mils (adhesive) What is mil thickness? Note: Specifications are those given by manufacturers and are not tested for accuracy. 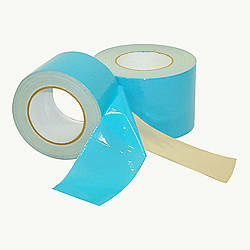 Please note that tape rolls are NOT guaranteed to be splice-free. 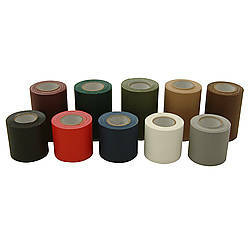 Tape rolls are typically cut to standard tape industry metric-cut sizes - or approx 5% narrower than the nominal size (i.e. 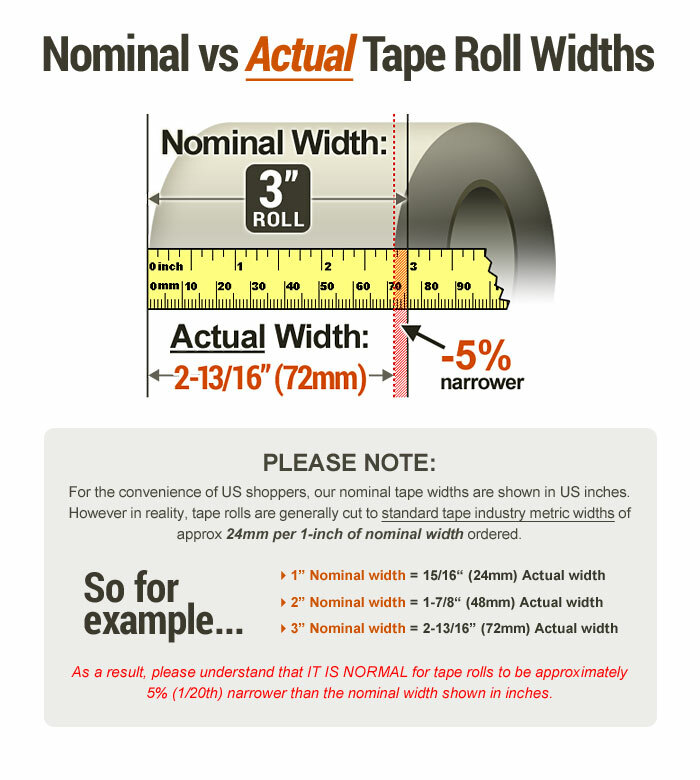 24mm per 1-inch of nominal width ordered). Please contact us to inquire about pricing for full-cut widths (e.g. a 6 inch roll cut to exactly 152mm instead of 144mm). 1 in. x 60 yds. 2 in. x 60 yds. 3 in. x 60 yds. 4 in. x 60 yds. 6 in. x 60 yds. 8 in. x 60 yds. Note that tape rolls are NOT guaranteed to be splice-free. 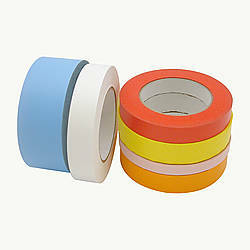 Need custom sized or "full-cut" width tapes? Many of our tapes come to our converter as full wide width "log rolls" (not pre-cut), and can be custom cut to widths not shown in the pricing table. 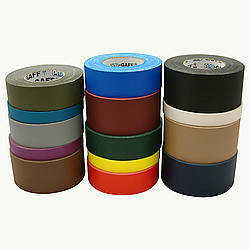 Contact us today for pricing and minimum requirements to order your desired tape in a custom width. Please note that since this tape comes in "log roll" format most rolls ship on a plain white core (i.e. with no branding or text inside the core). Special orders are non-returnable (and non-cancelable if materials have been already ordered or cut before the cancellation request was received). Minimum requirements apply because a size may be non-stock or if special setup is required to cut rolls to your desired custom width. Minimum Quantities: If a particular size has a minimum item requirement, please only order that size in multiples of that minimum (e.g. if the minimum is 12, then use multiples like 12, 24, 36, etc). Offers the widest range of application flexibility available. Exhibits excellent processing performance whether manually or automatically applied. 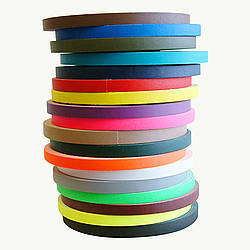 Has superior tensile strength, adhesion properties and holding force which ensures consistent, reliable seals. Hot melt adhesive will bond faster to a surface which is referred to as quick-grab or quick-stick. It typically has higher tack (will feel stickier to the touch), but is also softer. It has lower heat resistance, shear resistance, and sometimes UV resistance than an acrylic adhesive. NOTE: it is called hot melt because the adhesive is applied hot by the manufacturer and then hardens as it cools (you do not need to apply heat to the tape yourself). Properties are similar to that of hot melt rubber, but natural rubber often holds where other adhesives won't (recycled fibers, dust, cold, heat and heavy loads). It provides good overall adhesion and moisture resistance. Offer excellent performance, especially for applications in temperatures less than 40°F and greater then 120°F. It provides excellent clarity, has high shear strength, is usually more permanent/durable even when exposed to moisture, and it ages well over extended periods in fluorescent and sunlight. Since it remains clear for the life of the application and does not yellow over time it is ideal for applications such as sealing white cartons. While it has good initial adhesion it does take 24-48 hours to cure and to achieve its maximum bond strength (has gradual adhesion buildup). Another difference between hot melt rubber and acrylic adhesive is if you fold tape over making the two adhesive sides touch the acrylic adhesive will remain attached to the carrier (e.g. paper, film) while a hot melt adhesive will stick to itself and pull off of the carrier. It is the best choice for clarity, UV resistance and aging characteristics. Is great for extreme temperature applications since silicone adhesive can work in continuous operating temperatures from -100°F to 500°F. They also exhibit good chemical resistance, retain electrical properties, and remove cleanly with little or no residue. Zinc oxide based adhesive formula is a skin-friendly adhesive which is commonly used on sports medicine tapes. Thickness, AKA caliper or gauge, refers to the distance from one surface of a tape backing, or adhesive, to the other. Search by product name, SKU, manufacturer or keyword. Copyright ©2003-2019 FindTape.com LLC. All Rights Reserved.